This past spring and summer, two mature white pines (Pinus strobus) at the rear of Bond Lodges along Chester Road, suddenly turned brown and died. The first one went off color during Commencement week at the end of May. A visual inspection of the trunk and top with binoculars gave no indication of cause. Not long after that, the second tree started to go off-color and inspections found small mounds of sawdust mixed with sap on the trunk. This was an immediate indication of some type of bark beetle, but which one? Having never run across bark beetles on pines at the Arboretum, I turned to the Internet and books for a clue. The mounds of sawdust and resin on the bark were pretty good indications of Southern Pine Beetle (Dendroctonus frontalis) infestation, as was the blue staining of the wood caused by a fungus transmitted by the beetle. 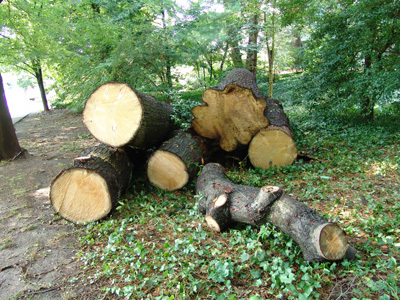 A call to Bartlett Tree Expert Company confirmed that it was too late for the first two trees, but a couple of applications of an insecticide named Onyx (bifenthrin) would protect the other three trees in the group. Because of the size and location of the dead trees, it was late summer before they could be taken down. Once on the ground, we discovered the branches in the upper crown riddled with tiny holes. This is a good indication of Ips Beetle, sometimes known as Engraver Beetle. After peeling the bark away we could see the intricate patterns formed by the larva as they fed on the inner bark, hence the name Engraver Beetle. We still have not confirmed whether it was the Pine Engraver Beetle (Ips pini) or the Small Southern Pine Engraver Beetle (Ips avulas). 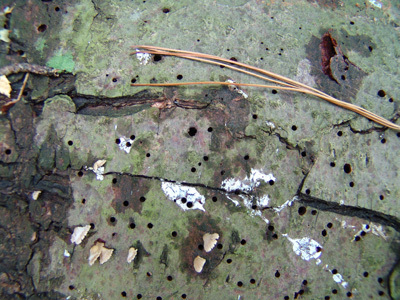 While Ips Beetles are less aggressive than Dendroctonus Beetles, they will attack trees under stress. 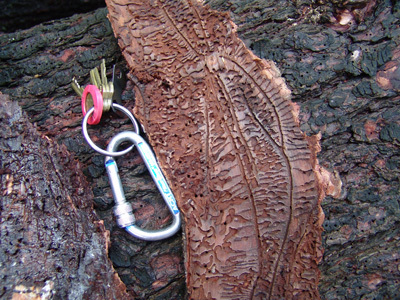 While we are within the natural range of Ips beetles, most literature says we are north of the Pine Bark beetle range. Communication with University of Delaware entomologists indicates that activity in southern New Jersey and Delaware are becoming more common due to climate changes. Hopefully scouting and protective sprays will prevent further damage to the other trees. 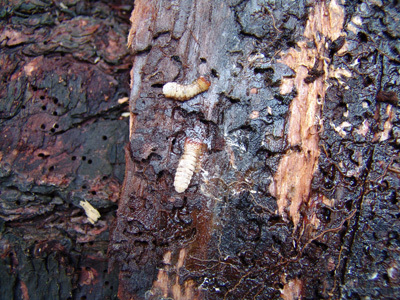 Here are some tips if you are concerned about pine bark beetles in your garden. First, if your white pines are dropping some yellow needles, don’t panic! White pines do drop old needles this time of year, and as long as it is not the new growth there is no need to worry. Second, scout around your pine trees in mid-spring and summer. 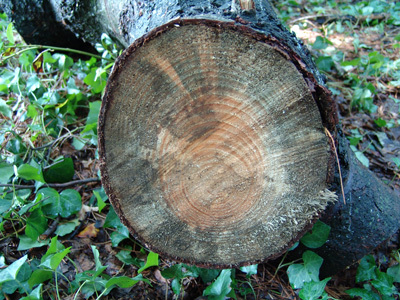 If you notice sawdust lumps mixed with sap on the bark or see a fine sawdust on the ground or on plants around your tree, call in an arborist to check it out. Glad you found our blog, and we were able to help. Sorry to hear about your pines, what area are you from?